This is very good news for patriots and very bad news for Paul Ryan. I just went to the “Primary Paul Ryan” Facebook page and liked it. It’s now up to almost 23,000 likes. Trump is making noises he will support and campaign for whoever primaries Ryan and I’m all up for that. Ryan is far worse than even John Boehner was. He totally betrayed conservatives and America in general by giving Barack Obama everything he wanted and more in the Omnibus bill. “Well, if you would’ve told me this year that we’d be standing here celebrating the passage of an omnibus bill, with no poison pill riders, at higher [spending] levels above sequesters than even the president requested, I wouldn’t have believed it, but here we are,” Democratic Sen. Chuck Schumer told reporters shortly after the $1.1 trillion omnibus bill was passed. When you’ve got Schumer praising Ryan, you’ve got a really big RINO problem. Wonder who bought Ryan? House Speaker Paul Ryan, a veritable turncoat who sold out every conservative in America last week when he signed off on a $1.1-trillion omnibus bill that handed President Barack Obama everything he wanted, might be on the verge of suffering some major payback for his treachery. Moreover, Crow’s poignant message got picked up by The Gateway Pundit and Fox News and eventually made its way onto the Facebook page for the Wisconsin Tea Party. And it may have just gotten even worse for Ryan tonight, as a Wisconsin Trump representative indicated that the billionaire GOP frontrunner “could possibly get behind” a primary challenger to Ryan. It would indeed be a nightmare for Ryan if Donald Trump campaigned and fundraised against him in 2016, especially if he continues to steamroll towards the nomination. 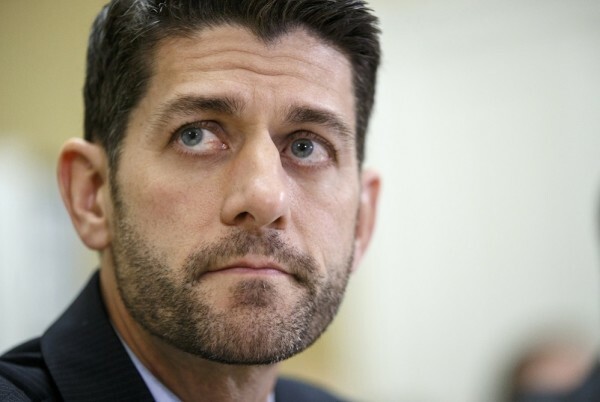 This means, in effect, that the movement to get rid of backstabber Paul Ryan has officially begun. In fact, someone already set up a “Primary Paul Ryan” Facebook page that had already accumulated over 18,000 followers by Monday morning. Whoever runs against Ryan will have to have deep pockets. He’s got $5 million in campaign funds that line is war chest. “This candidate will need a truckload of cash to make this an actual race,” Ken Crow explained. “This means we all need to reach deep and find an extra $10 or 20.00 bill to send to this candidate. If 200 or 300,000 of us do this, now we have a very real chance of knocking off Ryan in the primary and winning the general election.” Republicans in Wisconsin have until April 5, 2016, to find a suitable candidate and raise enough money to take down treasonous Paul Ryan. I hope this gains momentum and I wish them victory in Wisconsin. Ryan needs to go and fast and the Tea Party are just the patriots to do it.